So the outlook over the next few years for the Gold Coast appears good, particularly considering the preparations that will be necessary for the 2018 Commonwealth Games. 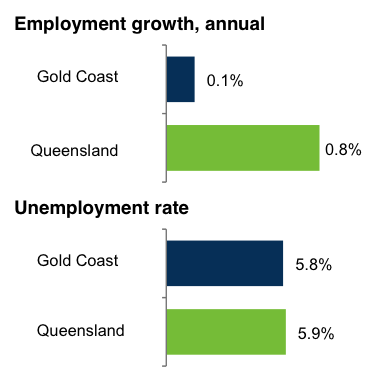 Gold Coasters will certainly welcome employment growth, as the local jobs market has been sluggish recently (see chart below I’ve borrowed from Queensland Treasury’s regional labour force brief). This entry was posted in Gold Coast, Labour market and tagged abs, employment, goldcoast, labourforce, labourmarket, qld, queensland, tourism. Bookmark the permalink. Tradies have rolled off construction of the new Gold Coast University Hospital, to Commonwealth Games Infrastructure…. but what next …. a casino or cruise ship terminal…..perhaps.